'Ya know, I don't know. Yeah, that's right. I'm going to break my regular blogging pattern and post an update. Scary, I know. Hopefully it won't be such a rarity in the future. I didn't really intend to get locked into the whole 'blogging once a week' thing (and I guess I didn't really) but only meant that to be the bare minimum. Yeah. Wow. I ramble about the most random things. I guess everyone doesn't need to know (or care) about my blog posting psychology. I guess it's one of those lonely computer geek things. Anyway, I'm going to cut this thought off and get to the meat of the matter. Ok, so maybe the meat of the matter has already been picked clean by the Aegypiinae. "At what am I looking?" you may ask. (By the way, you may not ask, "What am I looking at?" That is grammatically incorrect and I will smack you with silence if you do.) Well, to answer your properly phrased question, you are looking at my first ZBrush sculpture! It was fun to play around with, and I'm pretty please with the results. However, I'm suffer no dillusions and realize that it really isn't all that great. For one thing the proportions are lacking rather badly (though, considering the time I spent on it I'm ok with that.) So yeah, that's that. 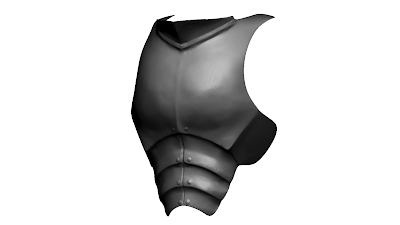 You're looking at about 2-3 hours of doodling with ZBrush. This, ladies and gentlemen, is a vase. Yeah, I know it's awesome. It's also what I whipped up at the beginning of class so that I had something to turn in for my review. 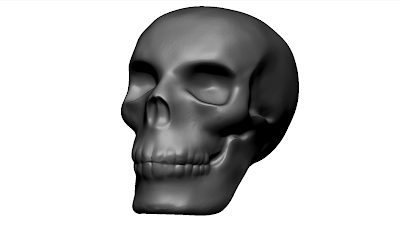 It was also the time that I discovered the Macintosh ZBrush files aren't compatible with Windows ZBrush. (I couldn't turn in my skull!!! Urgh.) Anyway. 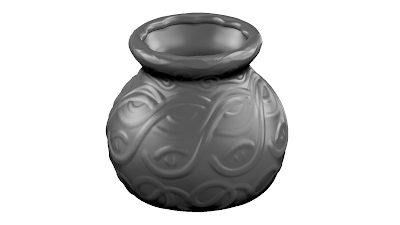 It's a pot. I had a lot of fun with the radial brush as you can probably tell. Here are my final two props. You did know that I was making "props," right? My teacher gave us a list of different categories of stuff we could do and each had their own point value. All of our props had to add up to 10 points. Anyway. I made these last two because everything else on the list looked really boring (Who would want to sculpt a sock, honestly?) 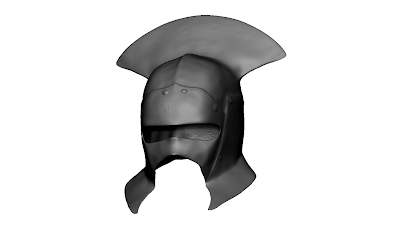 If you don't recognize them, they're the helm and cuirass of the Uruk-Hai from Lord of the Rings. Predictable, I know. I guess it was fresh in my mind from doing the Mighty Muggs. Or maybe it's because I can see eight books related to Lord of the Rings from where I'm sitting right now. (That isn't counting the trilogy itself.) Yeah, I'm a geek. So, that's what I've been up to... last night. And I guess some of it is from last week, too. That's all for now. Stay tuned, I hope to be posting some concept art for a new project in the next day or two.